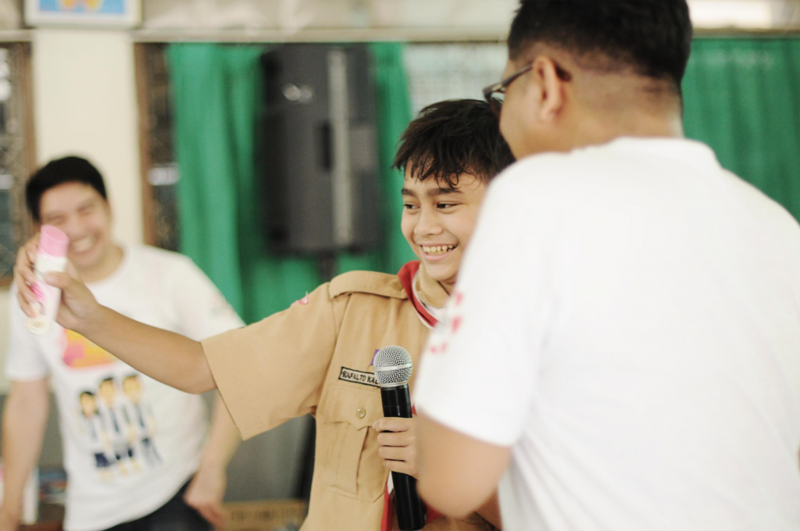 Jakarta, 3 October 2018 – This year, YCAB Foundation and PT Kao Indonesia collaborated in a school campaign on self-esteem for youths. Remaja KAO’s Campaign (Creative, Active, Optimistic) main target was youth, the age group that are not just growing biologically, but also changing physically as and psychologically. They are eager in finding themselves, their talents and passion to gain maximum potential in their lives. The teenage phase is also seen as a golden moment, where there will be many important things that happened and will affect their lives and characters in the future. This year, Remaja KAO’s Campaign has visited 25 junior high schools in Jakarta, Karawang, and Cikarang. This campaign has reached more than 2.800 youths. This campaign discussed and elaborated the importance of self-esteem. Youth were taught on giving self-appreciation through positive thinking, on surrounding themselves in a healthy and supportive environment, and on being confident with everything that they have. “I want to directly apply what I received in my daily routine, I want to become more confident, hardworking, and persevering,” said Luna when YCAB’s team asked what she got out of joining this campaign. Luna, who was one of the students at SMPN 107 Jakarta, said that it is very important to share the importance of self-esteem to other youth like her, as it really is providing a positive influence for her life. Photo Caption: Alto, one of the Remaja KAO Campaign participants, hoped that more of teens like him can feel the same benefit of this program. Another student hoped that this campaign would be repeated to a larger audience. “It would be better and more fun with more people, I hope that all of the students in this school can participate in this campaign” said Alto, hoping that all his friends could get similar inspiration and knowledge like he did. “We are proud to see the enthusiasm from both teachers and students. The program was initially designed to reach 25 schools and 2.500 participants, but at the end it reached more than 2.800 teens. We hope that the awareness about self-esteem would be further shared by the participants to their communities” said Stella Tambunan – Treasurer of YCAB Foundation.